Water is treasured in the Kalahari and Karoo. At the bottom of the roaring Augrabies Falls lives a giant snake – but it is no ordinary serpent. This is a powerful mythic creature with mesmeric eyes, shimmering scales and a huge flawless diamond on its head for a crown. 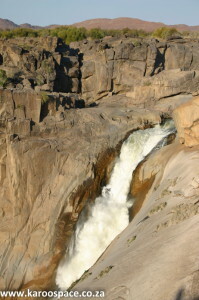 The Augrabies Falls, at the bottom of which, some say, lurks the diamond-crowned Watersnake. Khoi and San (Bushmen) belief has it that this enormous jewel can bring you great happiness – if you could only outwit the snake. But if you fall under its spell, you’ll be captured in its shimmering scales and pulled underwater into the churning froth, gone forever. No one has ever outwitted the snake. It might sound like a quaint little Kalahari fairy tale, but to this day the Watersnake (Waterslang) commands fear. Its influence stretches over the whole of the Karoo and Kalahari, especially where the Orange and Sak Rivers flow. There are many people who say they have seen it. Oom Sakkie Cloete of Eksteenfontein in the Richtersveld is one. “It was up at Vioolsdrif, on the Orange River, in October 1974. It was a hot day, and I went to wash in the river. “That’s when I saw it. It was just a black thing in the river at first. Oom Sakkie Cloete of Eksteenfontein in the Richtersveld. “I thought it was a tree, but then I saw it was coming against the current. Was it a goose or some kind of bird then? No, it was too big. “I saw its head, as big as a horse’s head or maybe bigger, and then behind it, three huge black bows of its body coming out the water. Then I don’t remember anything more. I think I ran. “They say Heitsi-Eibib appears in many different forms. But I saw him as a snake. “They say he’s often at the Wondergat near Cornell’s Kop. I’ve heard of people that saw him and went completely grey, or could no longer speak. Jeanette Abrahams of Williston also saw the Watersnake along the Sak River, when she was a child on the farm Skuinskloof. She explained that the Watersnake can travel from place to place as a warrelwind (dust devil). It takes any form, and at night it walks with light. Sometimes it sits close to humans, and is harmless unless anyone tries to hurt it. Oom Johannes Willemse, Griqua shaman from Beaufort West district. Oom Johannes Willemse, a Griqua shaman from the farm Theefontein within sight of the Nuweveld mountains near Beaufort West, has also seen the Watersnake. When he was a youngster, he washed himself in the river without asking permission of it. He saw the Watersnake as a long silver line in the water. His grandfather, a healer, told him he could get free of this affliction by sacrificing a chicken and rubbing himself with a certain kind of mud, and by expressing remorse to the Watersnake. There is a firm belief that if the Watersnake is threatened, hurt or disrespected, destructive floods follow. Oom Johannes said it was no coincidence that there were flash floods across the Karoo in February 2011. The announcement that Shell wanted to frack for shale gas had just been made, he pointed out. Daantjie Japhta, head of the Khoi Inqua people. “The Watersnake will not allow it,” he said. Echoing him was Daantjie Japhta, former mayor Graaff-Reinet and now acknowledged head of one of the largest Khoi clans, the Inqua. He too was raised on stories of the Watersnake – and adds that the Khoi as a nation are against fracking. 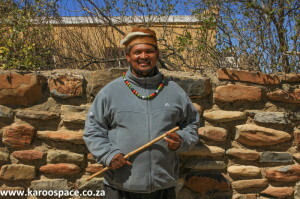 Toetie Dow of Graaff-Reinet represents the San people of the Eastern Cape, and he says they too oppose fracking because of its threat to water. 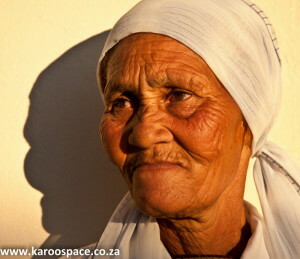 Toetie Dow, who stands for the San people, Eastern Cape. 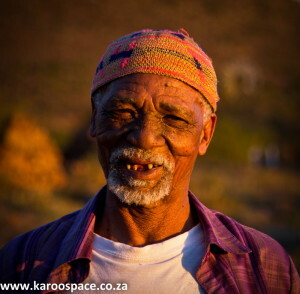 But the Khoi, Nama and San people are not the only ones with a reverence and respect for water in the drylands. Every little Karoo and Kalahari spring that bubbled to the surface was named by European explorers and migrant farmers, and often the farms were named for them too. Drive across the Karoo and most of the signs will point to something mentioning water and its defining qualities or surroundings: Soetfontein, Koffiefontein, Brakfontein, Quaggasfontein, Saaifontein, Brandvlei and hundreds of others. Sometimes the lack of water was noted, as in Verneuk Pan (Deception Pan) or Putsonderwater (well without water). 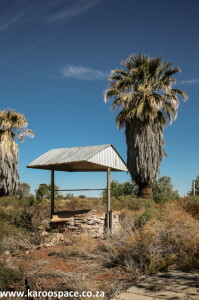 An empty well still stands at the abandoned railway siding that is Putsonderwater. The latter’s name dates back to the 1880s, when this piece of land was owned by David Ockhuis. He and his sons found a good vein of water, but the problem was that trekboers kept arriving on his doorstep asking for some. Ockhuis, being coloured and not having a title to the land was afraid that if everyone found out about his precious water, he’d lose the farm. So every time anyone arrived asking about the well, he’d say “Ja meneer, ek het ‘n put, maar dit is ‘n put sonder water.” (Yes, sir, I have a well, but it is a well without water.) And the name just stuck. Water, or the lack of it, has always been the defining issue in the Karoo and Kalahari. Things changed dramatically after windpumps arrived in South Africa, able to pump up groundwater. A wooden Halladay Standard was the very first, imported by PJ du Toit of Hopetown in 1874, according to James Walton in his book Windpumps in South Africa. Before then, water was usually raised from depth by manpower or donkeypower. In Upington you can see a statue of a blindfolded donkey turning a ‘bakkiespump’ to commemorate those days. The windpumps opened up the drylands of South Africa for farming, in the same way they did the prairies of the USA. But windpumps can only supply so much. Rain is crucial. Ask any farmer to tell you his never-fail signs that forecast rain when the veld is dry, often trusted more than the barometers on their stoeps. In the Karoo, farmers listen for the sound of the nocturnal rain grasshopper, also called the gysie or langasem for the strange sound it makes, like a small generator starting up. Once it calls, it will rain within three days. They’ll watch out for swallows and swifts flying low, and for tortoises heading for higher ground, and for ants and harvester termites that are busier than normal. But when the koggelmander stands on a rock facing north, they say, expect flash flooding. 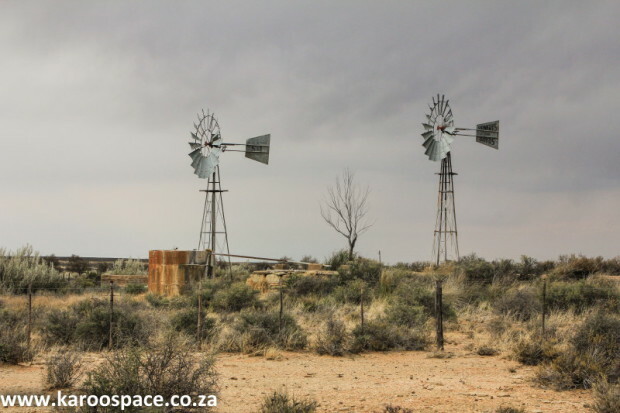 Windpumps made stock farming possible in the drylands of the Karoo and Kalahari. During the prolonged rains of 1894, a man called Gordon Rautenbach built himself a raft, called the boat the Molopo Majestic and sailed across the Kalahari desert from Inkbos Pan beyond Noeniput to Noordoewer. Droughts and occasionally, floods, are a constant feature of desert life. When Victoria West flooded in February, 1871, a bride drowned while trying on her wedding dress, whole families at dinner were swept away, and a roomful of revellers at Quirk’s Hotel died while a certain Mrs Jacobsohn and her children floated off to safety on a featherbed. The most notorious flood in the Karoo took place in 1981, in Laingsburg, when the normally dry Buffalo River turned into a raging torrent within hours. At least 100 people lost their lives and houses vanished far under the floodwaters. There was one farmer who decided bypass the agonising waits between droughts and floods, and make his own rain. Charlie Hall lived at The Willows between Middelburg and Cradock from 1910 to 1976. If you know where to look as you drive along the N10, you can still glimpse the chimneys of the rain-making boilers where he’d burn strange substances he was convinced seeded the clouds with rain. 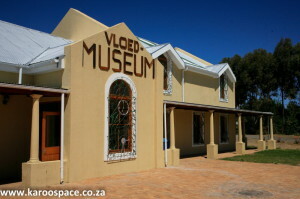 In fact, said Elana Kitching, curator of Grootfontein Agricultural College’s museum, Hall would be quite upset if a neighbouring farmer mentioned he’d had rain and failed to thank him for it. 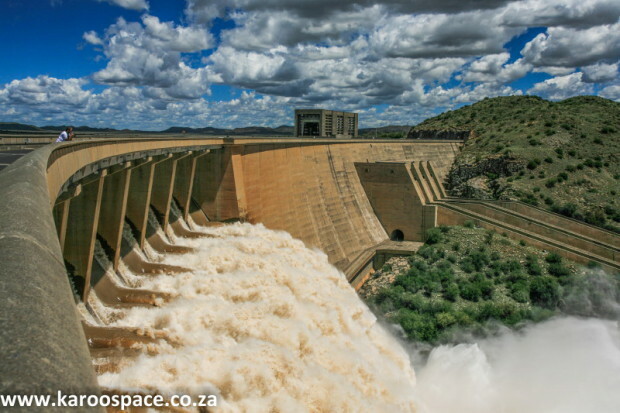 The Apartheid government also decided to bypass this dependence on tenuous rainfall and devised an ambitious project to bring a constant flow of water from the wet Highlands of Lesotho to the fertile soils of the Eastern Karoo Midlands. The Gariep Dam with all sluices open. In the mid-1960s, they began to build the Gariep Dam, then named for Prime Minister Hendrik Verwoerd. They brought in the best water engineers money could buy. For a few heady years around Venterstad, Oviston and Steynsburg, there was as much French and Italian spoken as English and Afrikaans. 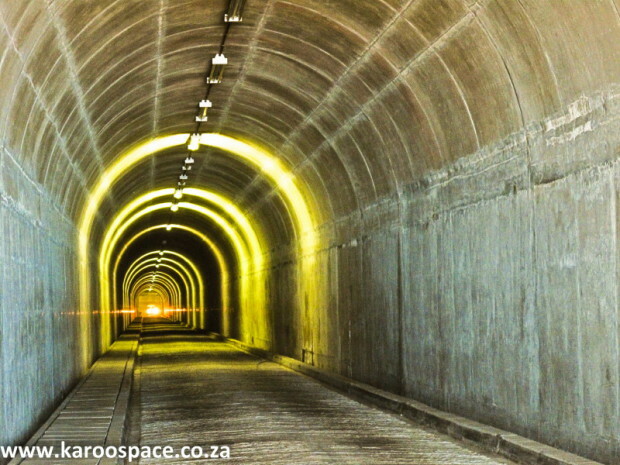 Once that was finished, the government began on the next highly ambitious scheme – to create what was then the longest water-transport tunnel in the world, linking the dam’s water to the Great Fish River. The 83km Orange-Fish tunnel was dug under the Suurberg Mountains by three teams. They tunnelled through mudstone, ironstone, sandstone and lethally explosive pockets of methane. Entrance to the Orange-Fish River tunnel. One underground fire lasted for months and melted the rock. At least 102 people, most of them from France and Italy, died during the construction, finished in 1976. A simple plaque commemorates their contribution, which enabled the multi-billion Fish River and Sundays River irrigation schemes. 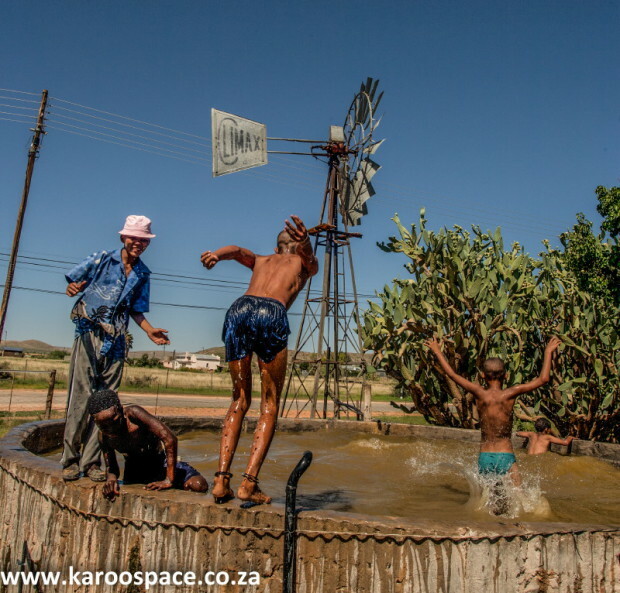 But very few Karoo towns are lucky enough to have a constant flow of water. In fact more than 80% depend on groundwater. And sometimes things go wrong. Beaufort West recently suffered one of the worst droughts in living history when the dam dried and motorists were urged to drop off bottled water. By the end of 2010, more than a million litres had been dropped off in the parched town. 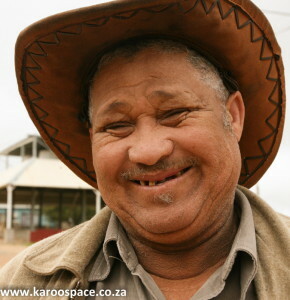 Singer Antoinette Pienaar, who is learning about healing Karoo plants from Oom Johannes Willemse the Griqua Shaman, says half the townspeople were visiting the churches to pray for rain and the other half were “in the klowe, pleading with the Watersnake”. One of them worked, because in February 2011, the flash floods filled up the dam. 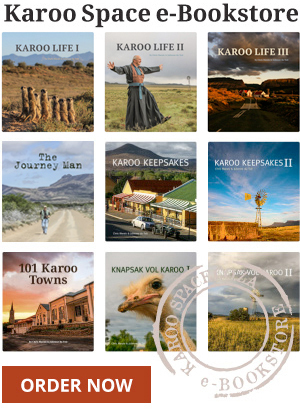 For more Karoo Life, get our Ebook Special HERE. Did you know that there is an unfriendly water snake in the E Cape Transkei area which is believed to live in the ground water? It is widely believed in the rural areas, abetted by unscrupulous water-sellers, that a water well is a route for the snake to climb to the surface and harm people, which is why many wells/boreholes in that area are filled up with rocks and stones. Water Snakes are well known all over the Ciskei and Transkei, even KZN – probably all rural areas. I have fished many a river over the last 40 years and the fishermen all tell the same story…. When angry it takes animals or children – esp young maids. I have discussed these stories a 1000 times and the most reasonable explanation is that these snakes do exist, or did exist, at one or other time – but that the story is then carried on for generations without having seen one in a long time. All of these at one or other time lived in the deeper rivers where the fish were plenty, esp after the introduction of carp and sharp toothed barbel to the rivers in the late 1800’s. The Umzimvubu River (Hippo in Xhosa) gives an idea as to why it was given that name. Some rivers run from the sea far up country and are deep enough for baby Bullshark to reach over a 100 km inland (from Port St Johns well past Mthatha), even higher when the rivers are in flood! A friend of mine is often called to remove snakes, one was a feared monster outside a villiage – it turned out to be an 8 f’t Rock Python. The locals could have done away with it but fear made it about 50 times the size of animal actually living on the odd goat, dog, chicken, etc. Now don’t think that is all – some pythons are HUGE and have been known to take humans – that being the cause of the stories, maids go to draw water with buckets and the python pounces on the child…. My own Mom was seriously afraid of snakes – at the age of 40 she vaulted a 4ft fence in a few strides after encountering a Puffadder that was really minding its own business!!! I once saw three men carry an eel – over their shoulders with both ends almost touching the ground – maybe 5 meters in length. I once had a dried Eel skin that was more than 30 cm in girth. We went down to the river a few years ago and my son screamed his head off when a Land Monitor the size of a Crocodile came running up – the farmer indicated that it was half tame and huge because they fed them on leftovers from their chicken farm. So yes, the Monsters are arround – but are shy and avoid Humans as much as possible – Humans just do not understand properly because we just love to make up stories ..
Hendrik Verwoerd was never President, he was Prime Minister. So the 83km Orange-Fish tunnel found lots of methane – no wonder Shell et al want to explore gas production possibilities. Leave a Reply to Yetypu Click here to cancel reply.